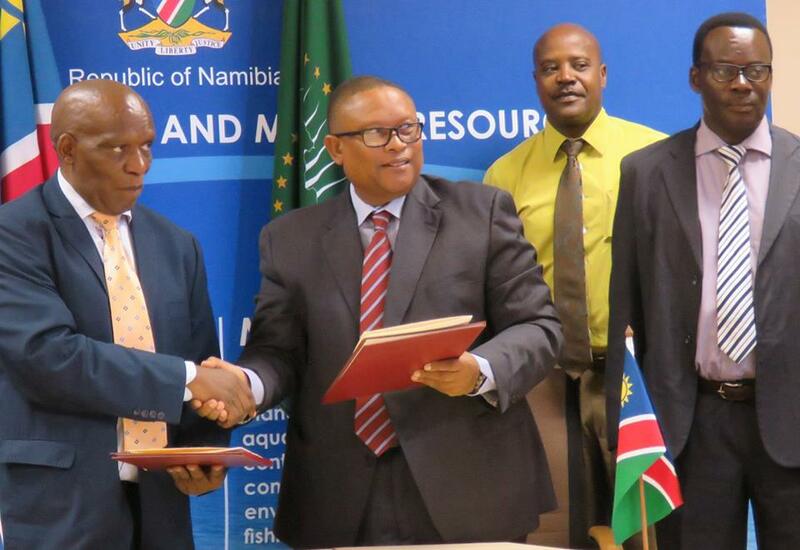 Namibia and South Africa will henceforth expand their cooperation on all fisheries and aquaculture related matters to not only benefit both countries through the Blue Economy concept but to increase the production volumes in the factories of Walvis Bay by as much as 40 percent by 2022. The Minister of Fisheries and Marine Resources, Bernhard Esau met with his counterpart from South Africa, Senzeni Zokwana, the Minister of Agriculture, Forestry and Fisheries to expand cooperation between the two countries even further with the signing of a new Memorandum of Understanding in Windhoek. The new MoU is aimed at defining a framework through which both countries will not only strengthen existing relationships, but also undertake specific bilateral activities of mutual benefit to both countries. The new MoU outlines nine key areas of cooperation which will ensure cooperation in research on fisheries and aquaculture; monitoring, control and surveillance of fish resources; capacity building and development; data and information sharing; collaboration on policies; collaboration on economic development of fisheries; collaboration on value addition; collaboration on fisheries aspects in the so-called Blue Economy and promoting the development of common positions of advantage. “It has taken some time to reach this stage, during when our officials deliberated on details pertained in the new Memorandum of Understanding, and our governments ultimately considered and approved the final text through the established protocols,” Minister Esau said. According to Minister Esau Namibia and South Africa are already cooperating in fisheries through several forums, starting from our joint membership in the Benguela Current Commission along with Angola, and in several other international fisheries management organizations such as ICCAT and SEAFO, where the countries are already cooperating on research and resource management. “Indeed, the value chains of several of our fish species are quite intertwined, and several South African fishing companies are integrated in both countries. I am therefore happy to note that this MoU contains provisions on exchange of ideas on policies to maximize sustainable socioeconomic development of previously disadvantaged persons in both countries,” Essau said. Both ministers agreed that the Blue Economy concept is at the core of envisaged secondary socio-economic development in both countries. “The Blue Economy is the foundation on which growth will be realised and true cooperation is done,” Minister Senzeni Zokwana said. 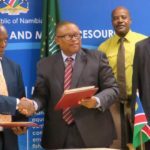 Namibia is a key fishing and processing hub in the Southern Atlantic Ocean and the ultimate aim of the newly refreshed cooperation agreement is to increase the volume of fish handled, canned and otherwise processed in Walvis Bay cumulatively by 40 per cent by 2022.